The Lp(a) test measures the lipoprotein (a) blood level. Lp(a) blood testing is done to help assess cardiovascular risk. What is a lipoprotein (a) test? The lipoprotein (a) test, also known as an Lp(a) test, is a lab test that checks the lipoprotein (a) blood level. Why is a Lp(a) testing important? The Lp(a) blood test is considered a strong predictor or blood vessel disease. 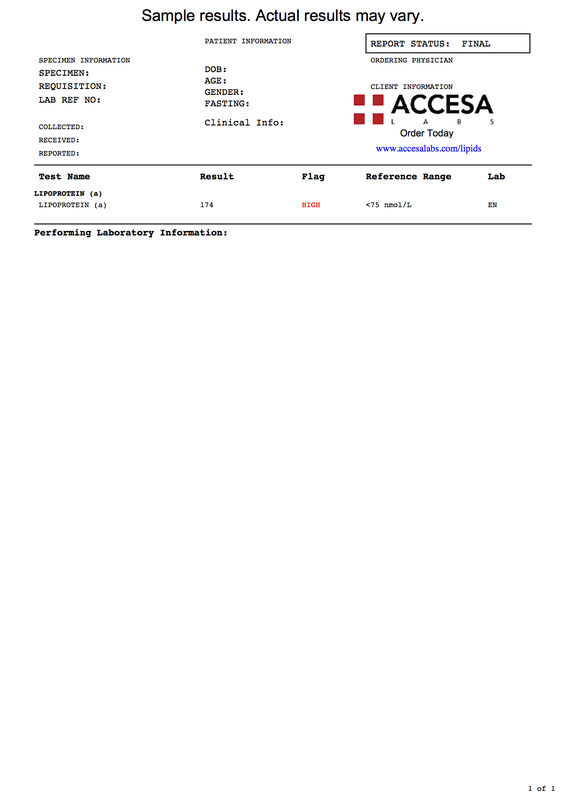 This Lipoprotein (a) Test is a blood test. The lipoprotein (a) test, also known as an Lp(a) test, Lp(a) blood test and lipoprotein (a) lab test, measures the Lp(a) blood level. Lipoprotein(a), or Lp(a), is, as one might expect, a type of molecule known as a lipoprotein. Lp(a) is considered a major risk factor for cardiovascular disease and high levels are thought to be strongly associated with heart disease. In particular, lipoprotein (a) is thought to be a strong predictor of future atherosclerotic disease and Lp(a) concentrations >30mg/dL are thought to increase disease cardiovascular risk by as much as six times. General Lp(a) blood testing is recommended for anyone who wants to check one marker correlated with cardiac disease risk. Additionally, people who have a family history of cardiovascular disease, high cholesterol, a history of heart surgery or stents, or early heart disease should be checked. For a more detailed look at their cardiovascular risk profile, the Lp(a) testing is often ordered with the CRP test and a homocysteine test or the more detailed VAP blood test panel. To get an lipoprotein (a) test near you, simply order online and get tested at a local lab. Once you get your blood drawn at the Quest Diagnostics lab location, your Lp(a) lab results will be available electronically relatively quickly. As can be seen on the lipoprotein(a) sample report link above, your Lp(a) results will be reported as a numerical result in nmol/L. The lab will also report a reference range based on the lab equipment used for processing the sample. In this sample report, the range is <75 nmol/L which is a fairly standard target for Lp(a) levels. Lipoprotein (a) Test at Guaranteed Prices.